Developers building on the Node environment can now integrate and interact with ChartMogul more easily than ever, with our new Node.js client library. Get started with it today! At ChartMogul, we want any subscription business to be able to integrate ChartMogul with maximum ease and minimum fuss. In some cases, this means building a suite of tools and plugins like our recently-updated Google Sheets app, which allows you to import data directly from a spreadsheet. Metrics API gives you access to your SaaS metrics and analytics data – to put ChartMogul’s insights wherever is most valuable for your team. These APIs form the basis of all integrations with ChartMogul, and as such are consumed and maintained by us, to reflect the functionality of the platform. BUT, if you want a way to get going even faster with the ChartMogul APIs, we have something for you! We recently launched a Ruby client library, for those of you building apps with Ruby. Today, we’re happy to unveil our Node.js client library, for everyone using the Node environment. The Node client library is fully open source. We’re encouraging the developer community to suggest improvements or raise issues, so that we can maintain the best possible implementation for you. Check out the project on GitHub if you want to have a look around. Full documentation and code examples for usage will soon be available on our Developer Hub very soon, but until then you can find everything you need, including a full list of supported methods, parameters and errors in the project’s README. 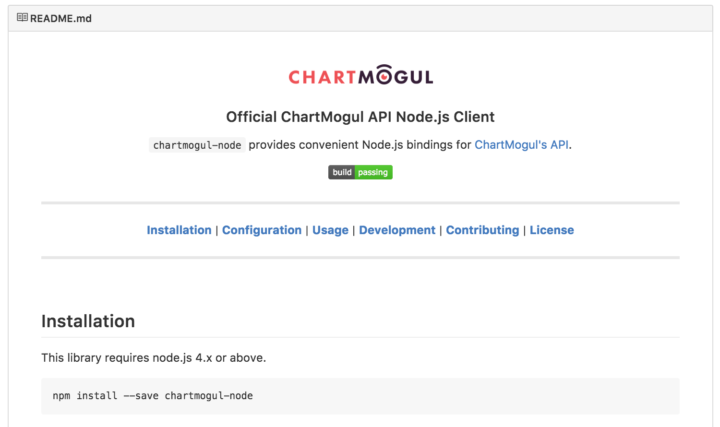 The Node.js client is our second client library for the ChartMogul platform. We have plans for more plenty more languages and frameworks in the coming months. If you have something specific that would make your life easier when interacting with ChartMogul, let us know via email so we can prioritize accordingly.